These vegan gluten free chocolate chip cookies are so good no one will ever guess they’re gluten free. 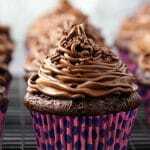 Super easy to make, soft, chewy and totally divine. 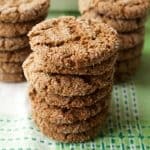 The recipes on this blog have not been particularly focused towards gluten-free, but my mother is gluten intolerant so whenever she comes to visit, I usually do some gluten-free baking for her. So I’m always dabbling a little in the waters of gluten-free baking. And I do love it when I can make something vegan and gluten-free that is totally undetectable. If no one can tell that it’s either vegan or gluten-free (let alone both) then I know we have a winner. 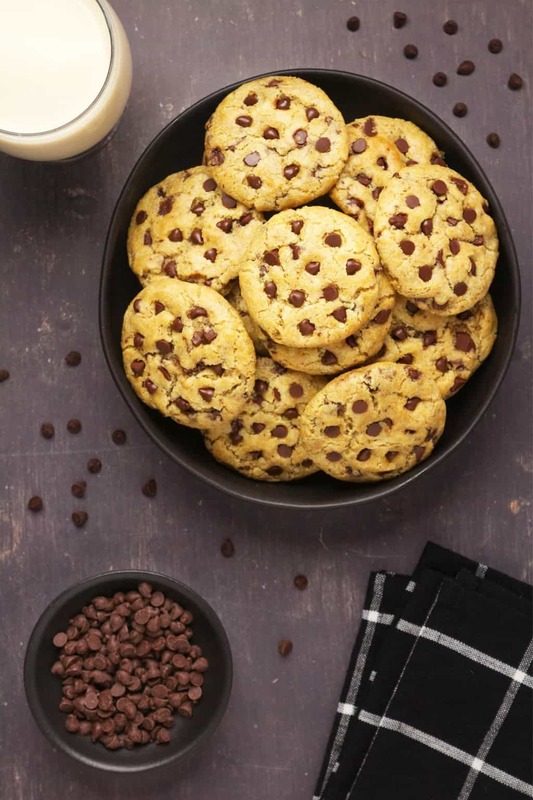 These cookies are all that and more. 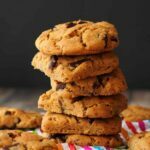 They are pretty much like the best vegan gluten-free chocolate chip cookies ever! And I’m not the only one who thinks so. These have been taste tested and enthusiastically approved by some very much non-vegan and non-gluten-free peeps too! Which makes me super happy. 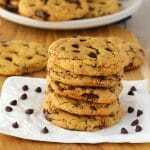 This recipe is adapted from our recipe for regular vegan chocolate chip cookies. That recipe was a big hit so we didn’t have to change too many things when switching it for gluten-free. Preheat the oven to 350°F and line a baking sheet with parchment paper. Add some vegan butter and sugar to the bowl of a stand mixer and cream them together. Then add in a flax egg (ground flaxseed meal mixed with hot water) and some vanilla and mix that up. Then add in some gluten-free all purpose flour, baking soda, salt and cornstarch and mix (by hand) into a thick batter. Then add in a mix of vegan chocolate chips and chocolate chunks and mix that into the batter. If the batter seems a little dry at this point, add in a little non-dairy milk. I used 2 Tablespoons but you may use more or less depending on the brand of vegan butter that you used. Roll into balls and place evenly onto your parchment lined tray, aim for around 20 balls. Place into the oven and bake for 15 minutes. The cookies will be lightly browned on the top but still very soft when they come out. 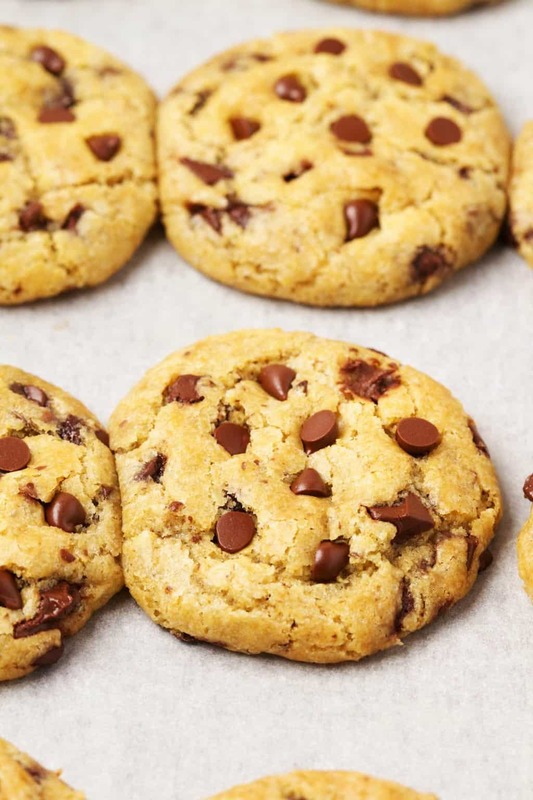 As soon as they come out the oven, press some more vegan chocolate chips directly into the tops of the cookies. Let them cool and firm up on the tray before removing them. The kind of vegan butter you use can make a difference in how wet or dry your cookie dough is. A very soft spread type of vegan butter will have a higher water content than a hard type of vegan butter. And then even between brands of buttery spreads, there can be a difference. 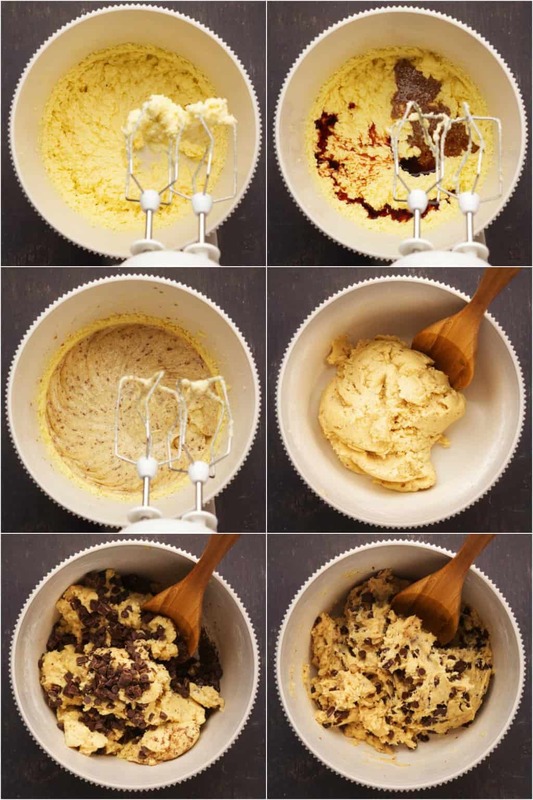 So this is where you have to use your bakers intuition and judge how much non-dairy milk to add in to your cookie dough before you roll it into balls. I used 2 tablespoons of soy milk and that was perfect. You want a dough that sticks together easily and rolls into balls easily. 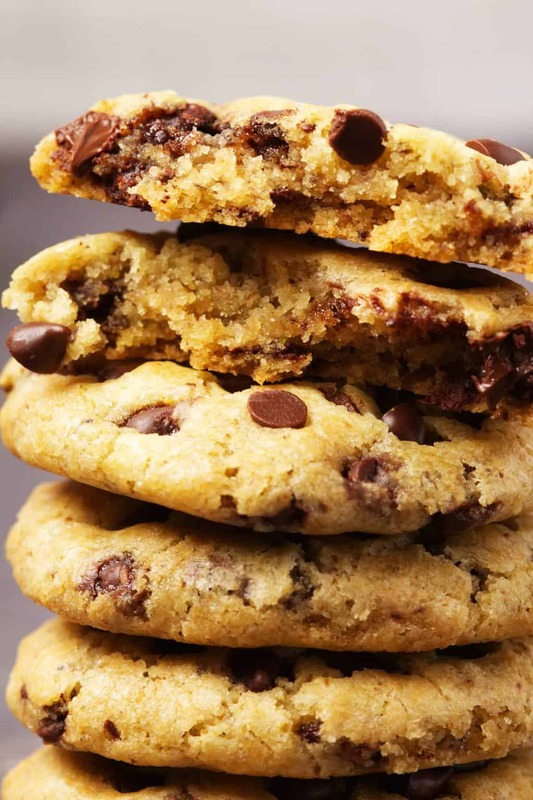 You can lean a little more towards a wetter cookie dough for these cookies (but not wet). You must still be able to roll them into balls without them just sticking to your hands. If it’s just sticking to your hands then you’ve gone too far in the other direction and will need to add a little more flour to balance things out. I tried these with coconut oil and it did work, but seemed a little oily. The overall taste and texture result with vegan butter was better. 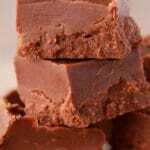 You can always make your own homemade vegan butter as well and use that, it works great in baking. 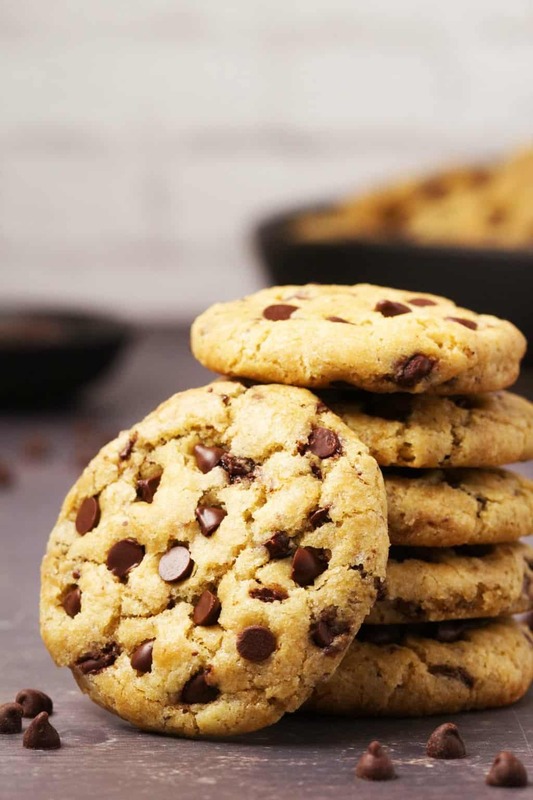 A gluten-free all purpose baking blend is the ideal flour to use for these cookies. I have not tested this recipe with a single type of flour like almond flour or chickpea flour or anything like that. My recommendation is to use a blend, they work so well it’s ridiculous! 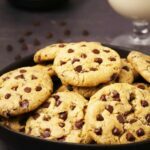 Packed with chocolate chunks and chocolate chips! Keep them covered at room temperature and enjoy within about 4 days or keep them stored in the fridge and that way they’ll stay fresh for up to a week. They are also freezer friendly so if you want to freeze them you can go ahead! 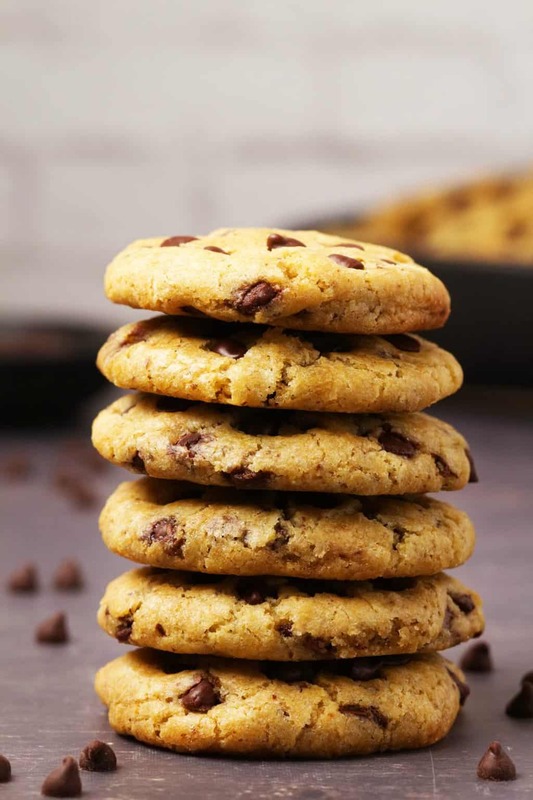 So let us know what you think of these vegan gluten free chocolate chip cookies in the comments and please rate the recipe too! Sign up to our email list and we’ll send you an awesome free recipe ebook containing 10 delicious vegan recipes and you’ll be the first to know when new recipes are posted to the blog. Preheat the oven to 350°F (180°C). Line a baking sheet with parchment paper and set aside. Add the vegan butter and sugar to the bowl of a stand mixer and cream them together. Prepare a flax egg by adding 1 Tbsp of ground flaxseed meal to a bowl and then adding 3 Tbsp of hot water from the kettle and letting it become gloopy. Add the flax egg and the vanilla into the mixing bowl and mix in. Then add in the gluten free all purpose flour, baking soda, salt and cornstarch and mix it in by hand (you can use a spoon but just don’t use the electric mixer for this part). Then add the chocolate chips and chocolate chunks and mix into a thick cookie dough. Add in the soy milk and mix in again. 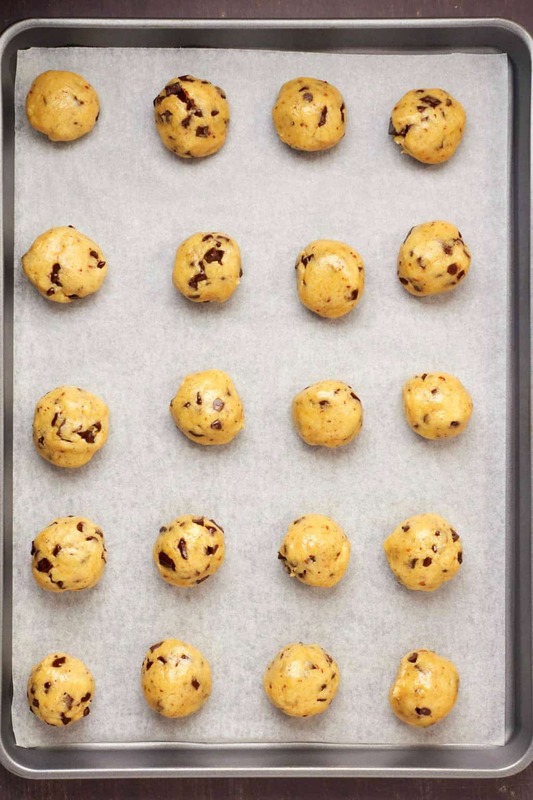 Roll into balls and place onto the parchment lined baking tray. Aim for 20 balls. Bake in the oven for 15 minutes until golden on top. 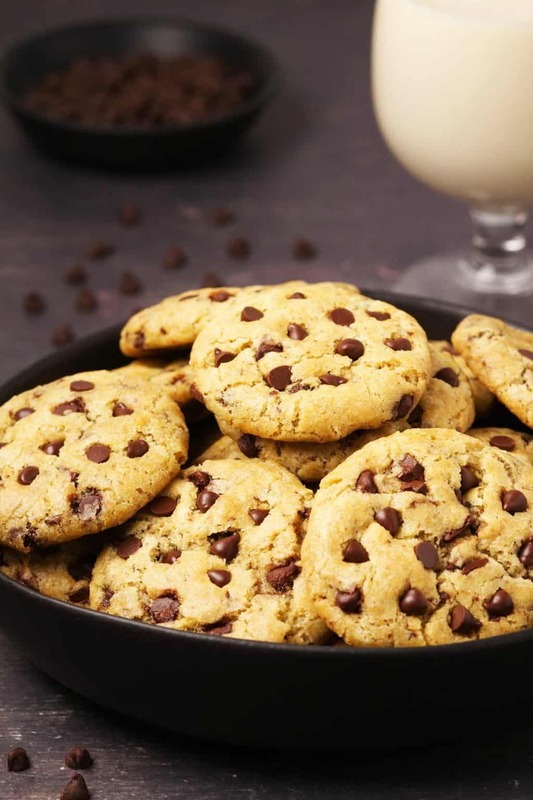 Remove from the oven and press some chocolate chips right into the tops of the warm cookies. Leave the cookies on the tray to cool and firm up. *I have found gluten-free flour blends to be a little denser (heavier) in weight than regular wheat flour. The gram measures for a cup of gluten-free all purpose flour online are not consistent. The only place I’ve found a clear measurement is on the back of a Bob’s Red Mill brand gluten free all purpose flour which was 1/4 cup = 34g so 1 cup = 136g. So I have generally gone with that as a measurement, no matter the brand of gluten-free all purpose flour I’ve used as it’s always seemed to be quite accurate when I check it. For the best accuracy, weigh your flour for this recipe, unless you’re very experienced in gluten-free baking. 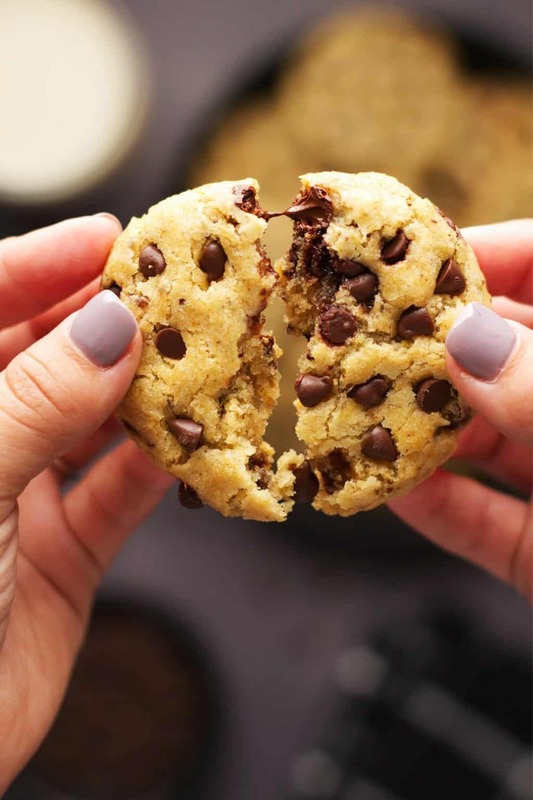 *You can use all vegan chocolate chips or all chocolate chunks (just chop your favorite vegan chocolate into chunks) if you like, but I like using a mix of the two. *The amount of non-dairy milk you’ll need will depend on the brand of vegan butter that you use. 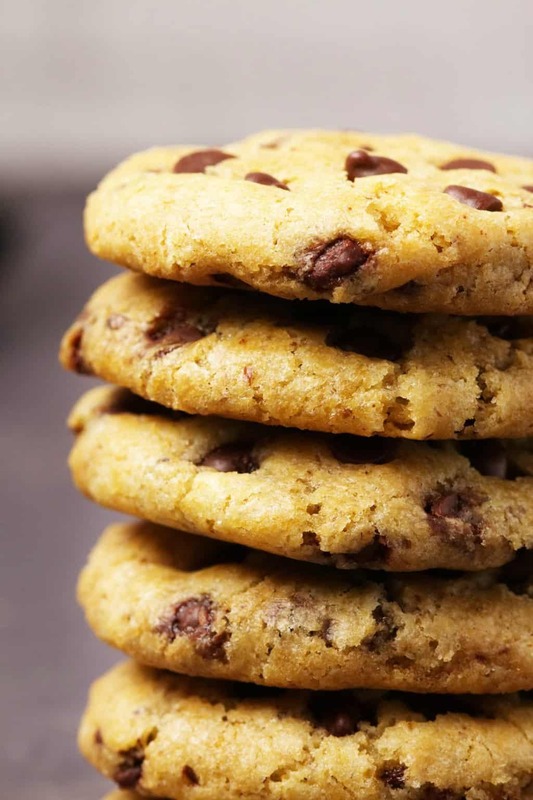 The cookie dough should be slightly ‘wet’ but should not stick to your hands when you roll the cookies into balls. So just see how much non-dairy milk you need and don’t use any more than necessary. 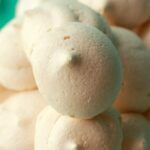 Vegan Meringue – Airy and Perfect! How much cornstarch are we using? Delightful and simple and ever so delectable.